Various people claim their roles as storytellers of Korea's turbulent modern history. Historians have long been praised for chronicling a series of milestone events and key historical figures who initiated or triggered tipping points at critical moments in the past. Books ― historians' preferred storytelling tool ― have been touted as one of the best sources to learn about history. In modern times, filmmakers chipped in and took part in educating viewers. Historical movies unravel catastrophic moments and major sociopolitical events that shaped Korea's modern history, stirring soul-searching in audiences about what went wrong. In the digital era, social media influencers are also emerging as storytellers. YouTube channels are gaining popularity as a tool of learning. Amid a swath of self-proclaimed history storytellers, there is a group of people whose role has been underappreciated, if not forgotten ― documentary photographers. "We, Koreans, have not been properly educated about images and this is why as storytellers, photographers came to be forgotten," Lee Kyu-sang said during a recent Korea Times interview. Lee, the founder and publisher of the Seoul-based photobook publishing house Noonbit Publishing Co., was cautiously optimistic about the future of photography, hoping that in the digital era, photography can gain long overdue attention as a storytelling tool. "Publishing photobooks has been a hard slog for me, partly because it is not a profitable business and partly because its reader base is not wide," he said. "But I think the future for photography is promising, because I think more and more people, particularly those outside the country who are curious about Korea, will want to see how Korea has transformed and where the country is heading." Over the past three decades since Lee founded Noonbit Publishing in 1988 on the sixth floor of a shabby old building in the neighborhood of Gwanghwamun Square in central Seoul, the publishing house has released 700 documentary photobooks. French photographer and documentary filmmaker Chris Marker's award-winning photo collection "Coreennes" was its first project. Released in 1989, it showcases the late Marker's photos taken during his 1958 visit to North Korea. In black and white photos, Marker captured ordinary North Koreans and their way of life. His photobook created a big buzz back then. As always in many highly successful projects, reactions from viewers about Marker's photo collection were polarizing. Some conservative experts painted publisher Lee as a North Korea sympathizer, while some lauded the book for giving a rare peek into the North. Following Noonbit's "stunning" debut as a photobook publisher with Marker's collection, the publishing house has released various photo collections taken by Korean as well as international photographers. The photos captured the Korean way of life, its tragic modern history spiraled in a series of political, economic and social upheavals, from the liberation from Japanese colonial rule in 1945, through the bloody 1950-53 Korean War, the country's miraculous economic growth at the expense of human rights, military dictatorships and the following surge of pro-democracy protests. Some photo collections feature North Koreans. Lee, 58, says his publishing house's three decades of collections illustrate the power of photography as a strong storytelling tool. If organized well in a proper context, he says photography can be more effective than any other tools in telling what happened in the past. In November, Noonbit celebrated its 30th anniversary by showcasing hundreds of photobooks it has published since 1988 at Space 22 in southern Seoul. Some photographers Lee teamed up with for book projects joined the ceremony. Lee says running the unprofitable business for three decades has been challenging but he has never thought of closing down. Although he owns a decades-old publishing house, he works like a startup entrepreneur. Multitasking has been part of his life to cut unnecessary costs. Unlike other established publishing houses where division of labor is highly valued as a source of efficiency, at his small publishing company, Lee oversees almost everything, from planning to editing photos to the publication of the photobooks. Lee even delivers books to his clients, if necessary. But such a workload doesn't bother him. He is a mission-driven person. Lee says he has a single-minded goal ― discovering photographers who are talented but unrecognized and giving them a way to succeed through publication. His unwavering commitment to discover authentic photos and the photographers behind them has paid off. Over the past decades, his publishing house, albeit small, has taken on a bigger role ― it has served as a career launchpad for many talented but unknown photographers. 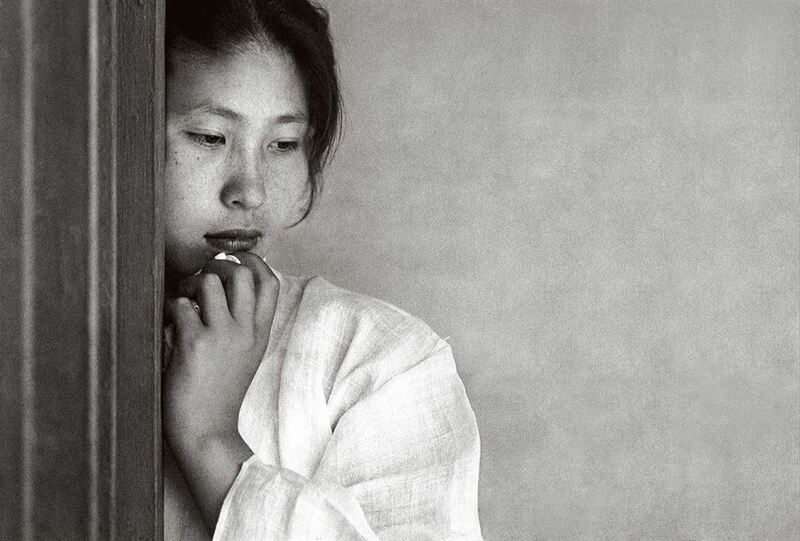 The late photographer Choi Min-shik's "Busan" was taken in 1965. Choi was a Busan-based photographer who took photos of the poorest of the poor. His photo book, "Human," was published in 2006. The late photographer Choi Min-shik, who died in February 2013, is one of the photographers whose career took off thanks to Lee's publishing house. "Choi was a Busan-based photographer who took photos of the Jagalchi Fish Market," Lee said. "He was a photographer who was underappreciated in his time. There needs to be some kind of work to address his role in Korean photo history and rediscover the values of his photo projects, albeit posthumously." Choi took 150,000 photos starting from the late 1950s. Lee met Choi one day in 2006 upon the latter's request. Choi was then looking for a publishing house that was willing to publish his photo collection. As his efforts were in vain, he called Lee and asked if Noonbit could publish his works. Noonbit released Choi's photo collection book, "Human," in 2006. It features some of his works taken from 1956 to 2006. Each photobook is a shard of a mosaic of Korea's turbulent modern history, as photographers captured different groups of people of different time periods ranging from 1945 to the present day. Some took photos of the poorest of the poor, the homeless and market vendors struggling to make ends meet in the post-Korean War years. 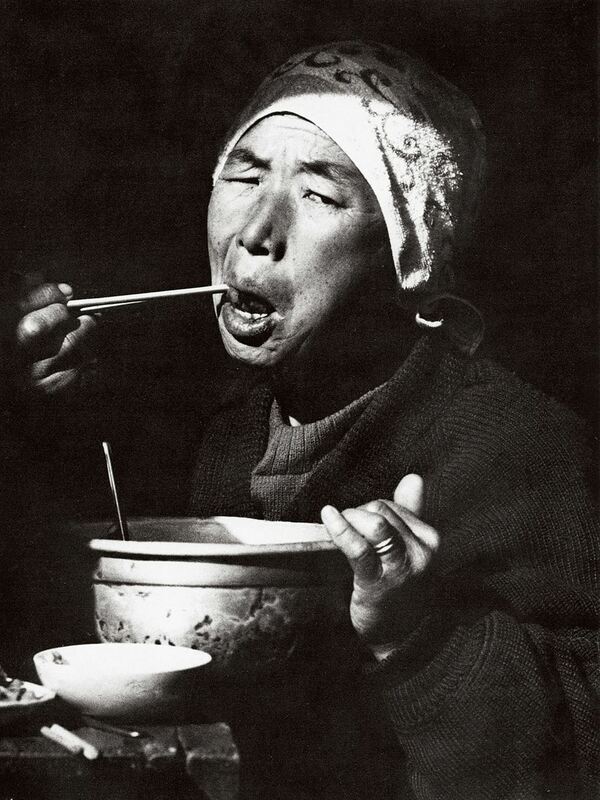 Women and girls with unwashed faces are eating noodles in Choi's black and white photos. They look noticeably insecure and their facial expressions reveal the tough life they had led. Japanese pastor and social activist Nomura Motoyuki captured the urban poor living in unspeakable conditions along Cheonggye Stream. The area later underwent a facelift as part of an urban beautification project in the early 2000s under then Seoul Mayor Lee Myung-bak before he was elected president in 2007. The Japanese photographer's collection, titled "Nomura Report," gives a rare glimpse of old Seoul's downtown and how people there led their lives before the area was changed. Photos taken in the 1980s feature a chaotic Korea following the "Seoul Spring." Demand for democracy and human rights surged after the assassination of the military general-turned-President Park Chung-hee in October 1979. Facing a military coup later that year, pro-democracy activists took to the streets. An activist who committed self-immolation to make his voice heard and fell from a rooftop while on fire, protesters who were arrested by the police, and the bereaved family mourning their sons or siblings who lost their lives while fighting for democracy and a power transfer from the military dictatorship to civilian rule were also captured in some old photos. 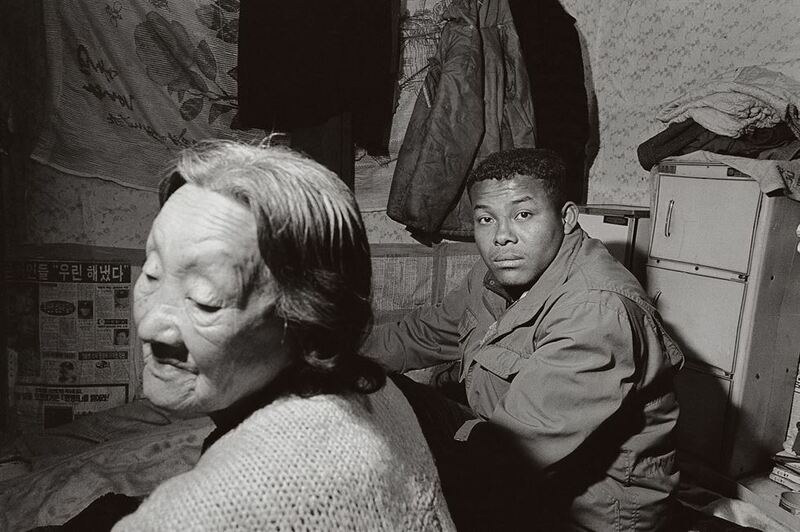 Lee Jae-gab's 1993 photo "Kim Jong-cheol and his grandmother," right top, shows the tough life biracial Koreans have lived in Korean society. Lee Jae-gap's photobook shows his lifetime pursuit of tracing the roots of diversity in Korea. His 1993 photo featuring the gloomy half-black, half-Korean Kim Jong-chul with his weary grandmother in their narrow room in Paju, Gyeonggi Province, is a snapshot of the tough life the biracial man had endured. Through his photo project, Lee learned biracial people have become part of the Korean population since 1947, two years after the United States Army Military Government in Korea was established following the country's liberation in 1945 with the end of World War II. The biracial population saw another surge after the outbreak of the 1950-53 Korean War as the United Nations-led multinational forces joined the war for South Korea. At that time, biracial people were treated brutally as the "homogeneous" Korean society was not prepared to accept diversity. The photos reflect such a sad history and the progress society has made. Byun Soon-cheol captured an unnamed contestant of KBS' longest-running program "National Song Contest" in the eastern coastal city of Sokcho, Gangwon Province, in 2013. Like the man, contestants of the program are ordinary citizens, including housewives, waitresses, farmers and restaurant owners, dressed up with full hair and makeup for their television appearances. Over the decades, Lee has abided by an uncompromising principle he had set regarding management of his publishing company ― earnings from book sales will be reinvested in publishing books. "It's difficult to run an unprofitable business. We are wrestling with a chronic deficit, partly because the entire publishing industry is struggling and demand for photobooks is not high. But this has not discouraged me from living up to my initial commitment of discovering talented but unknown photographers," he said. "It's tough, but manageable." Lee says the joy of finding a "diamond in the rough" is so great that he was able to run his business without much complaint for the past three decades. "The best moment of being a photobook publisher is when my months- or years-long hard work eventually leads to the publication of books in a wonderful manner," he says. "There is an old Korean saying that having plenty of pearls is meaningless unless they are weaved for certain jewelry products. My job is similar to that of jewelry makers. Photos are meaningful only when they are organized in accordance with a certain, consistent topic. Once I have done it with the publication of photobooks, I feel the immense joy of fulfillment. The feeling is so great that it outweighs all difficulties or challenges I had gone through all while I pulled together the book project." He says publishing photobooks is his calling. "One shiny day in the late 1990s ― about a decade after I established my own publishing company ― I came across a thought that I would never quit my business no matter how tough it would be to run it. I don't know why it came to me at that time though." When selecting photos for publication, Lee uses his own criteria. Each photo should display a clear, consistent theme, be related to Korea and show Korea's or Koreans' identity. "Photos also need to be related to Koreans, their way of life or tradition or history," he says. His uncompromising spirit has sometimes pitted him against some established photographers who he says prioritize the aesthetic value of photos. Lee describes himself as a rebel against mainstream photography. "Some people ask me why I don't work with famous photographers. Well… first of all they are already famous and they don't need my help. Second of all, there's a gap between mainstream photographers and me regarding our definition of authentic photos," he says. Lee hinted that he and some established photographers differ over their interpretation of what makes photos authentic. "Photographers can become famous if they take photos of famous people," he said, indicating fame is not the same as greatness. He cited photography featuring North Koreans as one of the examples showing a rift between him and others. "We've seen many photos taken by photographers during their visits to North Korea. There are some typical elements in those photos. The statue of the late North Korean leader Kim Il-sung, poor North Koreans, things like that," he said. He said such photos reflect a "learned perception" of the photographers and warned of its risks for documentary photographers. "They took photos featuring the statue of the North Korean leader or poor North Koreans because they had a perception that North Korea is a country like this and naturally noticed scenes featuring such imagery," he said. "There's sort of a tension between me and some photographers regarding the definition of what makes photos authentic. The rift is subtle, not outstanding, but we have very different views about photos. So in a way, my photobook project has been sort of my endeavor to challenge mainstream photographers' notions of authentic photos." He said he would publicly raise the authentic photo issue sometime in the future.